Our beautiful spacious, apartment has 3 double air conditioned bedrooms, 3 bathrooms, a fully fitted kitchen, a large lounge dining room and 3 large balconies. It is the only double sized apartment on the complex accommodating 6 comfortably. The balconies overlook the exclusive Regal Park which has 2-3 acres of landscaped gardens and three large swimming pools for the exclusive use of the guests and residents. This peaceful location is situated within a few minutes walk of the beautiful, sandy Candolim beach where you can soak up the sun. In the evening take a short stroll to the many high quality restaurants serving memorable Goan and traditional Indian food at very affordable prices. Candolim is ideally situated at the centre of the Goan coastline and easy to travel and explore the many unique Goan attractions and beaches. It is only an hour’s inexpensive taxi drive from the airport. 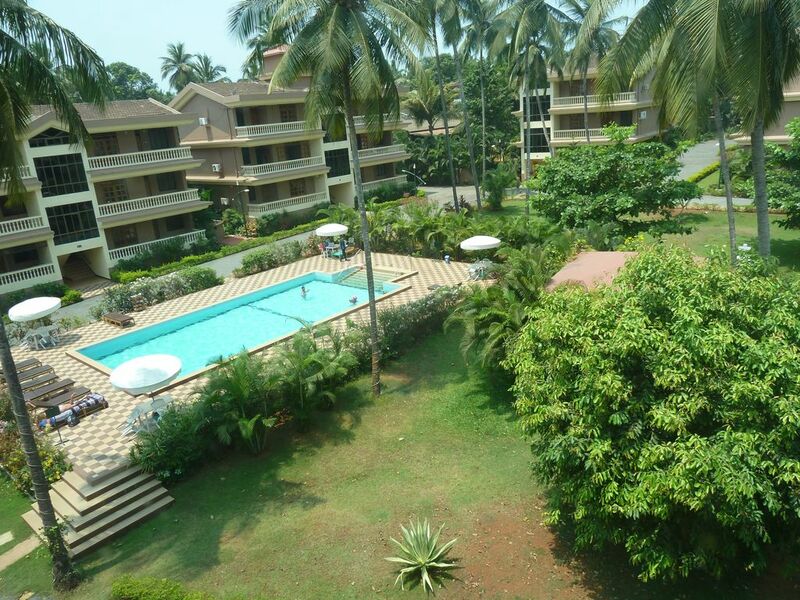 A very safe manned gated complex to ensure only residents and guests use the amenities. The bustling memorable Anjuna and Ingo markets are only a short taxi ride away. We have 3 daughters, two young adults and one at University. We fell in love with Candolim so we bought an apartment to enable us to have family holidays during the British winter. Regal Park is by far the best development in the area with extravagent use of space unlike other developments that seek to maximise return. Less than 10 minutes walk down a lane and you find yourself in the centre of Candolim with access to all of the restaurants/shops and entertainment. A few minutes further and you are by the Arabian sea which is one of the warmest you will experience. Regal Park is very quiet and relaxing with 3 full sized swimming pools for exclusive use of the guests and has a country club feel about it. This apartment is the only double size one in Regal Park and is set up to accommodate 6 comfortably. It consists of 3 bedrooms comprising 2 king size and 2 single beds with 3 large bathrooms. There are 3 large balconies with 2 overlooking the beautiful landscaped park on the ground floor. The charge includes maid service twice a week. There is also a manager overseeing the maintenance of the apartment in case they are needed. En-suite to bedrooms 1 and 2 with wash basin, shower, wc and water heater. Bathroom opposite bedroom 3 same as en-suites. All fully tiled and with water heater. There is parking on the complex. 6 seater corner couch. Walnut dining table and 6 chairs, Walnut desk, coffee table, ceiling fans, French doors to balcony with furniture. Flat screen TV and DVD. Integrated insect mesh throughout. Fully fitted beech units with granite work surfaces, fridge/ freezer, washing machine, water purifier, Smeg 4 ring hob, toaster, kettle, ceiling fan, iron and ironing board. Flat screen television supplied subject to an additional sky payment. The Regal Park complex is between 2-3 acres of landscaped gardens for the exclusive use of the guests. There are two large balconies on the front and one at the back. 3 large swimming pools supplied on the Regal Park complex for the exclusive use of the guests. Notes on accommodation: The apartment is situated on the ground floor and the balconies are child safe. This is the only double sized apartment on the Regal Park complex capable of accommodating 6 people easily. All windows and doors have fully fitted mosquito nets. A cot is not provided. Outside: The 3 large shared pools have sun loungers, chairs and tables with parasols and poolside shower. Beautiful gardens. Cleaning / Towels / Linen / Maid service: Towels and linen provided (not beach towels). Twice Weekly cleaning. Enjoyed our stay immensely and would book again. Lovely large property in a great location . Firstly a big thankyou to Rolf and Sandy for replying very promptly to my emails , excellent customer services and lots of information about the surrounding area etc . Regal Park is a lovely compelx , we have stayed there before but in a different apartment as at that time there were only two of us , as there were 5 of us this time we were delighted to be accepted for renting Rolf and Sandys apartment which has 3 large bedrooms of which 2 were en-suite and an extra bathroom directly opposite the third bedroom . There are also 3 large balcony’s and to be honest there was everything that you could possibly need , we were very comfortable during our stay . We would not hesitatate to rent this apartment again and also recommend it to friends and family . Five star accommodation and five star owners , thankyou so much from all of us for a fantastic and delightful stay . Yvonne Carver,Eddie Carver & friends 😁. Candolim beach is 8 minutes walk and approx 500m away. The beach has beautiful white sand, sun loungers and many traditional beach shacks which serve delicious inexpensive fresh food and drink. Water sports are available. Goa airport (Dabolim) is 35km away and takes 1 hour to drive and costs approx £15.00 by taxi. The centre of Candolim is only 6 minutes walk away and has a vast number of restaurants and bars. Panjim, the capital, is 20 mins drive where you can find interesting shops and department stores at cheap prices. You can also take a boat trip down the Mandovi river. Calangute (3km) and Baga (5km) are just along the coast. These vibrant towns have many night clubs. There are 2 night markets close by and another on Wednesdays at Anjuna (30 mins by taxi) all with live music, bars, food and many interesting and colourful stalls. There are many exclusive attractions to visit whilst in Goa. You can visit spice plantations, water falls, Hindu temples. Alternatively you can hand feed monkeys, take an elephant ride, visit a bird sanctuary or take a boat trip to see crocodiles and dolphins. There are often firework displays and festivals and markets are plentiful. Beauty treatments, ayurvedic massage, complete health checks, dental treatments and yoga classes are all available very cheaply. You will return home relaxed, refreshed and fully manicured. Booking Notes: Bookings are for a minimum of 1 week, arrival after 10am and departing not later than 11am on the final day. A 25% deposit is required to secure the booking with the remainder required 40 days prior to arrival. Entry to the apartment is via a key safe outside and will require a code that is sent out on payment completion along with the directions from Dabolim airport. Changeover Day: Vacate the apartment by 10am on the Sunday or the day of departure. Changeover days and times can be flexible depending on the dates of arrival and departure Notes on prices: Prices are for the property per week in UK Pounds. We are happy to consider different start and end dates for the Christmas fortnight but the cost will be £630 per week.